Most individual taxpayers tend to only check their tax certificates (IRP5s) when something goes wrong after submitting their annual tax returns. In most instances, taxpayers will not be allowed deductions or exemptions if there are errors. According to tax commentators, the most common errors are due to incorrect use of source codes. Employers are required to correct the errors and to resubmit their IRP5s to the South African Revenue Service (Sars). This not only delays tax but, says Craig Rocher, tax specialist at Tax Consulting, it may increase the risk of audits and verifications for employees. The use of wrong source codes has especially been experienced with travel reimbursements and the foreign remuneration exemption. Daylan Staude, tax lecturer at the University of Fort Hare, says when the IRP5 is coded incorrectly, employees may be deprived of the opportunity to claim relevant allowed deductible expenses. It is a requirement that the employer complete the IRP5 reconciliation and submit it to Sars before issuing it to their employees. “This is a little concerning as employees are only provided with an opportunity to check their IRP5s after submission to Sars. Practically, it would make more sense that employees are able to check it before the IRP5 reconciliation is performed and submitted to Sars,” says Staude. Piet Nel, head of the tax faculty at the South African Institute of Tax Professionals (Sait), says although employees should check their tax certificates, most neglect to do so. He says the codes are available on the Sars website. A problem identified by several tax commentators relates to the use of the incorrect source code for the tax exemption on foreign income. Rocher says if the incorrect code is used, the taxpayer will not receive the tax exemption on the income. He says that if the employer disclosed all the income (local and foreign earned income) under one code, and it included the foreign income that could qualify as exempt income, the IRP5 has to be corrected. In many instances this is only realised when the unsuspecting taxpayer receives a huge assessment for the tax exempt income earned abroad. Sars has become strict in recent years in terms of corrections on the IRP5. Previously the taxpayer could make the change electronically, but this was changed in 2016 to ensure the employer has insight into the change, says Rocher. NK Accounting Services owner and Sait regional representative Nikki Kennedy, says it is important that the employer indicate the portion of remuneration relating to foreign services. To qualify for an exemption from South African income tax the employee has to be outside the country for more than 183 days over a 12-month period, with at least one period of 60 consecutive days within the same 12-month period. “If the employer uses one source code (local income) for all the remuneration (local and foreign), instead of splitting out the foreign income under the correct foreign income source code, it makes it very difficult for the qualifying employee to be able to receive the exemption for the foreign income,” she says. Another common error has been with the incorrect use of source codes when employers have reimbursed employees for travel expenses. Rocher says the Income Tax Act does not specify the reimbursement rate, however Sars treats amounts in excess of its rate (R3.61 p/km) as taxable at normal income tax rates. Kennedy says if the rate exceeded the Sars rate and the business travel exceeded 12 000 km then the submission of a logbook is compulsory. She says that there is a reprieve offered by Sars from the March 1, 2018 tax year where there is no longer a limit on kilometres travelled, bearing in mind that the rate should not exceed the Sars allowable rate per kilometre. Kennedy says that if the employer used the wrong source this will prolong the finalisation of the assessment. NomadIQ’s managing partner Barendine Duvenhage, says employees should understand what rate they are being reimbursed at. If it is higher than R3.61 p/km, they should expect to see two lines on their payslips – one indicating the amount that was reimbursed at the Sars rate and the second line showing the amount that was above the reimbursement rate that will be fully taxable. The employee can claim a tax deduction for the excess portion when submitting his tax return. However, receiving a refund will depend on the value of the car and the total amount of travel done. Duvenhage says it is imperative to keep a logbook. 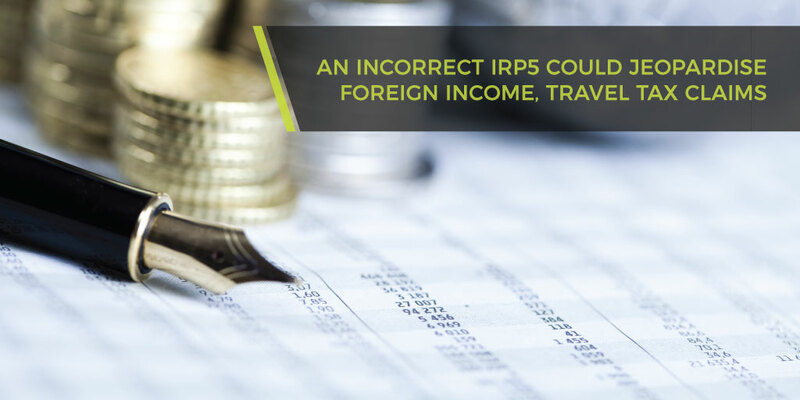 Tax commentators say it is generally not easy for ordinary taxpayers to spot mistakes on an IRP5. However, a good start is to compare the year to date totals on various items on the last payslip in a tax year with the amounts on the IRP5. She advises people to contact their payroll officers when they cannot reconcile amounts.